One of my priorities in life is to build a strong family unit for my kids. I want them to know that they always have a soft place to fall, that they can depend on us for anything, and that they are deeply loved. Isn’t that what every parent desires for her children? Family dinners. You have heard over and over the value of eating dinner together as a family. There have been studies showing that kids who eat dinner with their parents are more likely to do well in school, stay out of trouble, say no to drugs, and report general contentedness over those who don’t. It’s a wonderful time of sharing and bonding. Wondering what to do if your kids are picky eaters or choose not to come to the table? Make it a non-negotiable whether they eat or not. Wondering what you’ll talk about? Invest in a family questions series or find questions online. The small amount of money you’ll spend will pale in comparison to the benefits of family conversation. Weekly family meetings. On Sunday evenings, have a family meeting. It can be a half hour of your time, and you and your kids will look forward to it week after week. Spend a couple of minutes going over your schedule for the upcoming week, and highlight anything the whole family needs to know about. Then have each person in the family compliment or encourage every other person in the family, one by one. (Like, I go around and say something nice about everyone in the family, then my older daughter does it, then my younger daughter, and finally my husband.) Follow the warm fuzzies by a snack and a fun activity like board games or a family walk or whatever your group enjoys. It’s a quick ritual, but it is meaningful. Like I said, everyone will look forward to the family meeting each week. Family game night. My kids got the board game gene from us, and one of our favorite things to do is to play all together. Even my 4-year-old gets in on the action, playing as someone’s partner or by herself if she’s able. Campfires. Sitting around a campfire in the backyard is one of those things that creates instant bonding. There’s something magical about cozying up with a blanket next to someone and roasting hot dogs and marshmallows together. The kids always tell stories, and sometimes we go round robin and each tell a little piece of the story. We laugh and carry on and have a great time. We all treasure campfire time together. Read a book together. There are two ways you can approach this. The first is to read a single book aloud together. A second way is to read books for each age level, like the Jesus Calling series. There are three correlating books in this series: Jesus Calling for Little Ones, Jesus Calling for Kids, and Jesus Calling (for teens and adults). The books all match up, so if everyone reads #38 on the same day, you can discuss #38 together. Everyone will have read essentially the same content, but tailored to her own reading level and comprehension. Make sure you talk about it together! 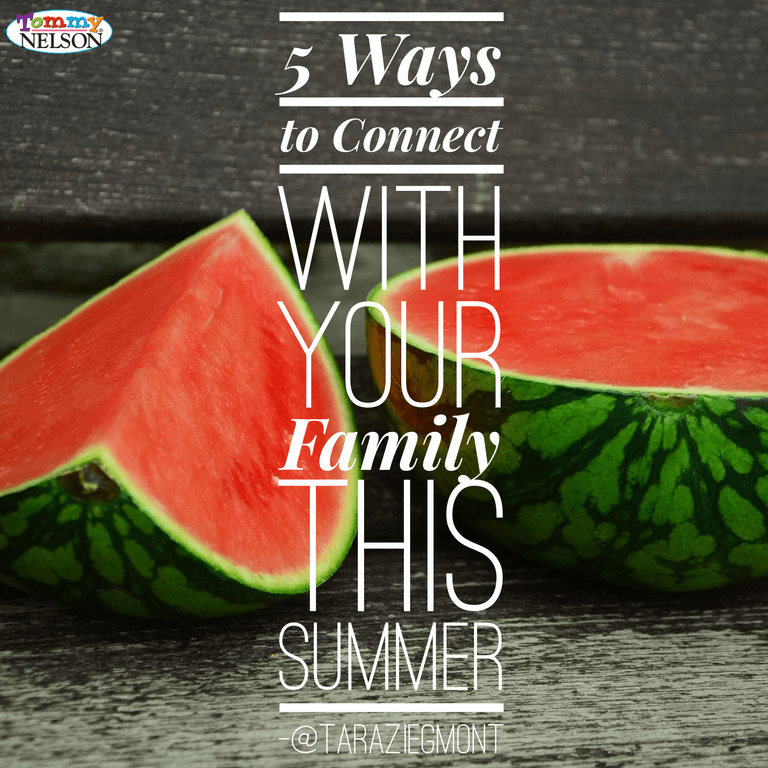 These are my favorite ways to connect with my family. What are yours? This entry was posted in Blog, Tommy Nelson and tagged Jesus Calling, Jesus Calling for Kids, Jesus Calling for Little Ones, Sarah Young, Tara Ziegmont by Tara Ziegmont. Bookmark the permalink.